Inteset 38-56 kHz Wideband Infrared (IR) Receiver Extender Cable for Cable Boxes, DVR's & STB's. Check Compatibility. 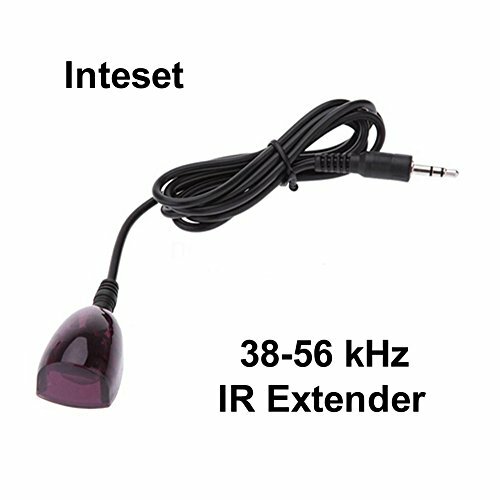 This newly designed 38-56 kHz Wideband STB IR Receiver Extender is made and sold exclusively by Inteset Technologies. It will work with nearly all Cable Set Top Boxes and DVRs that have an active IR IN port. Previously you had to choose either the 38 kHz or the 56 kHz model. This product eliminates having to make that choice but it will not work with all A/V devices. Please check compatibility below. This allows you to hide your STBs and DVRs behind closed doors in a cabinet or closet. The small receiver bud (1 1/4"L x 7/8"W x 5/8"H) will handle all of the same functions as if your device was out in the open. It comes with self stick tape on the back of the IR bud for easy installation. Be sure to mount the bud with a straight line-of-sight to your remote. It will work with most Comcast Xfinity and Verizon FIOS boxes as well as other cable providers that use Arris, Cisco, Scientific Atlanta and Motorola boxes except those noted below. It will NOT WORK with AT&T Uverse STBs, Motorola DCT or DCH Series, QIP2500, QIP6000 Series, DISH or DirectTV boxes. These models and some models specific to particular cable providers either do not have an IR IN port or that port is not active. The 4250 HDC is one of those. It also will NOT WORK with A/V Receivers, Amplifiers, TVs or IR Repeater Systems as the connectors are usually wired differently. If you have any questions about compatibility, contact us before you buy any extender. WORKS ONLY w/CABLE Set Top Boxes (STB). Please check your device to be sure you have an active 3.5 mini input port labeled "IR IN". Contact us if you have any questions about compatibility. If you have any questions about this product by Inteset, contact us by completing and submitting the form below. If you are looking for a specif part number, please include it with your message.